People work to live, right? So why aren’t they getting paid enough to live? Minimum wage in states differ, but there is a federal minimum that the states have to meet or go above. The federal minimum wage for the United States in October 2018 is $7.25 per hour, which is approximately $15,000 per year working full time. That is the minimum that the states have to pay you, and in most states, you cannot live off of the minimum wage due to the cost of living. Raising the minimum wage will help workers, businesses and the economy. 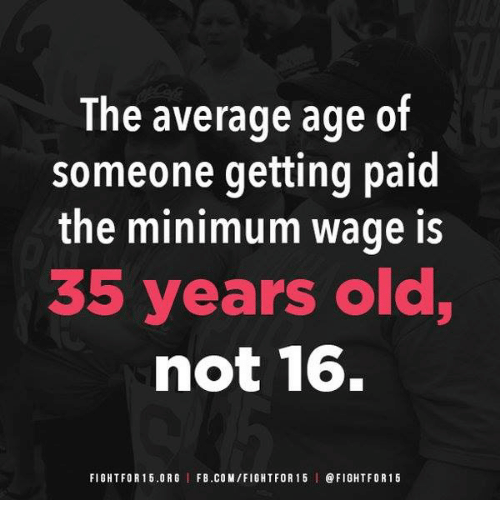 When you hear “minimum wage jobs”, you probably think about teenagers working in high school and college. That is not the case. In 2017, there were approximately 80 million workers, that were 16 years or older, working hourly jobs. People that are under the age of 25 only cover one-fifth of the population working hourly jobs. So four-fifths of the population are adults, adults with families and people to support. Raising the minimum wage would be a benefit for families and others that do not live with their parents. The wage would be considered livable when the person could live without having to be on government benefits programs such as welfare, food stamps, Medicaid, or subsidized/low-income housing. The federal minimum wage has not been raised since 2009, but the inflation rate has gone up. This is an issue due to people not being able to pay for things because they are not getting paid enough. People cannot pay their bills with what they earn because housing, insurance, and gas have gone up. Paying people more will not only allow them to live comfortably but will also increase consumer spending which will cause inflation. Raising the minimum wage will not kill jobs or change how many open jobs there are. Small and big businesses all over the country are willing to pay their employees a higher rate. Some companies are doing this now and are hiring employees at a higher rate. If someone is paid a higher amount the workers will have more motivation to keep working. The motivation will come because their work is paying off which will, in turn, help business turnover and absent rates decline. Resulting in businesses not having to spend as much money on training and materials. Raising the minimum wage will help the community and grow the country. Most of the people that this would benefit would be families, and grown adults. This would cause inflation from consumer spending, and it will not kill jobs. There is a living wage calculator where you can see the estimated costs of living in different situations.